Travel, Youth, & Juan For Fun | Let's Go Sago! And this what 5 teams of teens in their college years started to experience earlier today as Cebu Pacific‘s Juan for Fun Backpacker Challenge 2013 kicked off this afternoon in Resorts World Manila. The Cebu Pacific Air Juan for Fun Backpacker Challenge is a contest that brings 5 teams of 3 college students to 6 destinations all over the Philippines for a free adventure in 7 days! On its second year, Cebu Pacific Air opened the search to all Philippine colleges and universities a few months ago through a call for video entries answering why they should be chosen for the Cebu Pacific Backpacker Challenge. And from among the almost 100 entries, the 5 best emerged as the chosen finalist. The objective is for each team to have the most fun experiences at the most budget-friendly price from today – August 27 – to September 2, 2013. These are the two main components of the criteria which is at 50% each. Each of the 5 teams are armed with P35,000 to pay for their own lodging, food, and transport expenses (except airfare), among others. They were also given Wenger backpacks to carry their travel essentials and lent a Canon DSLR per team to take photos of their adventures. Each team is also assisted by 1 Marshall from the organizers. The Juan for Fun Ultimate Backpackers will take home 12 round-trip local/international tickets, 3D/2N Local tour package for three (3) courtesy of the Department of Tourism, 3 Wenger watches, 3 Samsung Galaxy Tablets, 3 Sun Pocket Wifi, 3 Sun Broadband Wireless Kits, and 3 Sun Broadband Wireless SIMs. The other teams will also be getting getting round-trip tickets as consolation prizes. Part of the challenge was the mystery of the 6 destinations, first of which is Metro Manila, where everything started earlier today. The other 5 Cebu Pacific destinations were revealed on the spot and they are the following (not necessarily in order): Kalibo, Dipolog, Puerto Princessa, Cebu, and Davao. Moreover, in each of the destinations including Metro Manila, the teams will face ‘fun‘ challenges. The first of which came as a surprise at the press conference venue in the form of the popular game ‘4 Pictures.’ The teams were given 4 photos which serves as clues to the answer which scrambled words as guide. The lone all-female team – Team Lemixian – emerged victorious in the first on-the-spot ‘fun‘ challenge. Does this forebode the upcoming results or is it just a beginner’s luck? It would also be interesting to note that the Backpacker Challenge 2012 won the Best Social Media Campaign at the Budgies and Travel Awards 2013 in Singapore. It was awarded during the Low Cost Airlines World Asia Pacific Congress. This years activity is co-presented by Sun Broadband, Department of Tourism, and supported by Wenger (the official travel gear) and Canon. Are you rooting for your own personal team of choice? Will it be #CEBteamLemixian, #CEBteamCrimson, #CEBteamAwesome, #CEBteamSeven or #CEBteamSunBroadband which will emerge as the winner of the 2nd Cebu Pacific Juan for Fun Backpacker Challenge? By this time tonight, they should have already landed in their 2nd destination in Kalibo, Aklan. 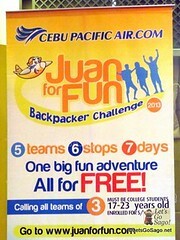 Follow their week-long all-expense paid adventure at www.juanforfun.com or with the hashtag #JuanForFun. Kudos to all the teams in the Juan for Fun Backpacker Challenge 2013.